The widening of I-44 through Tulsa will soon claim another mid-century building (see Modern Homes Make Way for I-44). This unusual landmark near Peoria, once known as the World Museum, is being emptied in preparation for demolition. 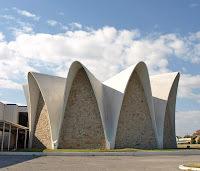 The concrete complex was built in 1963 by the Osborn Ministries as a museum and "Interstate Temple." Self-proclaimed minister, T. L. Osborn, and his wife, Daisy, traveled the world as Christian missionaries and collected art and artifacts on their journeys. The unusual La Concha-esque building housed their partial collection and distracted motorists touring along the new Skelly Bypass (aka I-44). The exterior of the building is adorned with maps of the world's continents. In its heyday there was a good deal more- a giant outline of Jesus was on one wall. The inscription below it, "REX," provided one of my earliest Latin lessons when I asked Dad why that building had my name on it. There was also a large globe that once stood out front as a visual reminder of the museum's name. Tulsa youngsters were treated to field trips to the museum throughout the Sixties and Seventies. Exhibits included paintings, large sculptures, a collection of music boxes, even a Rolls Royce. But the shrunken heads were by far the most talked about. Artifacts from native cultures from around the world were a prominent part of the museum. Jackie recalled a distinct "godless heathens" theme to most of the displays of African culture. By the late Seventies the museum business must have been faltering. Then came the infamous Oil Bust, which was a severe economic downturn for this area. The contents of the museum and art collection were auctioned off by Christie's in 1981. 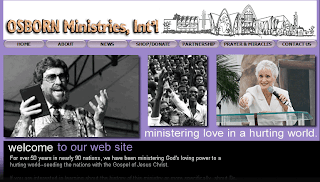 Osborn Ministries International still exists, even though they have not occupied this building for many years. Today their daughter LaDonna does most of the missionary work. In 1994 the building was donated to the Victory Bible Institute. I stepped inside to snap a few photos before this unusual complex and its local history are lost forever. Structurally the buildings appear quite sound. The circular concrete building hardly has any cracks in the mortar or facing. Inside, a drop ceiling has absorbed most of the ambiance the domed roof must have originally offered. Today the globe occupies center stage inside the round building, a dormant backdrop waiting for the bulldozer to come. What an outstanding complex. I unknowingly passed this on the highway when I was cruising from Tulsa to OKC and noticed it immediately as a landmark of significance. Thanks for the great background of its use and history. Too bad that the highway expansion will claim it. Seems like 106 or 4(f) should have identified it as a major historic resource and tried to avoid it and/or at least provided some outstanding mitigation for its loss. Wow. I had no idea the history of that building! I grew up in Jenks, and every Sunday and Wednesday our family drove by the Victory Bible Institute. Our car even broke down right in front of it once! What a colorful history, and it will be shame to see such an oddity go away. I remember the shrunken heads, and yes, it's the only thing I remember about the museum. I hate that all these things are being taken out by I-44, even though it proably needs to be done. Last night I passed by there and the east end of the building was down. Looks like now is your last chance to see it standing!